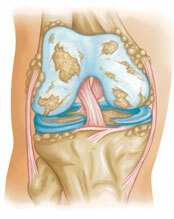 Generally, the pain associated with knee arthritis develops gradually, although sudden onset is also possible. > Arthroscopic surgery uses fiber optic technology to enable the surgeon to see inside the joint and clean it of debris or repair torn cartilage. > An osteotomy cuts the shinbone (tibia) or the thighbone (femur) to improve the alignment of the knee joint. > A total or partial knee arthroplasty replaces the severely damaged knee joint cartilage with metal and plastic. 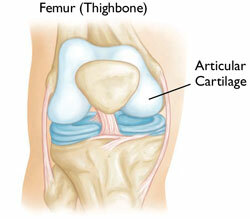 > Cartilage grafting is possible for some knees with limited or contained cartilage loss from trauma or arthritis.